Property 7: LAKE ANNECY RIVER WEST- St-JORIOZ LAKE CENTER "WARM AND CONVIVIAL"
Better Than Annecy! Hidden Gem Close to Annecy, But Without All The Congestion! Property 13: Better Than Annecy! Hidden Gem Close to Annecy, But Without All The Congestion! Property 14: Annecy the old, ideally located, 2 rooms any comfort, terrace and garden. Property 17: Charming property in unspoilt hamlet close to the lake. Property 27: The house of the Bear between its private garden and the bio top lake. Lovely house with big garden, nicely located. Property 31: Lovely house with big garden, nicely located. 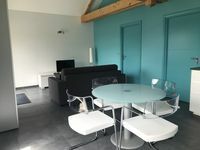 Property 39: Small house "cozy haven in the mountains"
Property 45: RENTAL VILLA VERY GOOD STANDING LAKE ANNECY for 8 p.
brand new one bedroom, clean quiet detached cottage. Close to Aix les Bains and the lake and shops. Owners are very helpful and respectful. Anything you need in the apartment--washer/ dryer, dishwasher heated floors...functional and clean and lovely view. HIghly recomended!